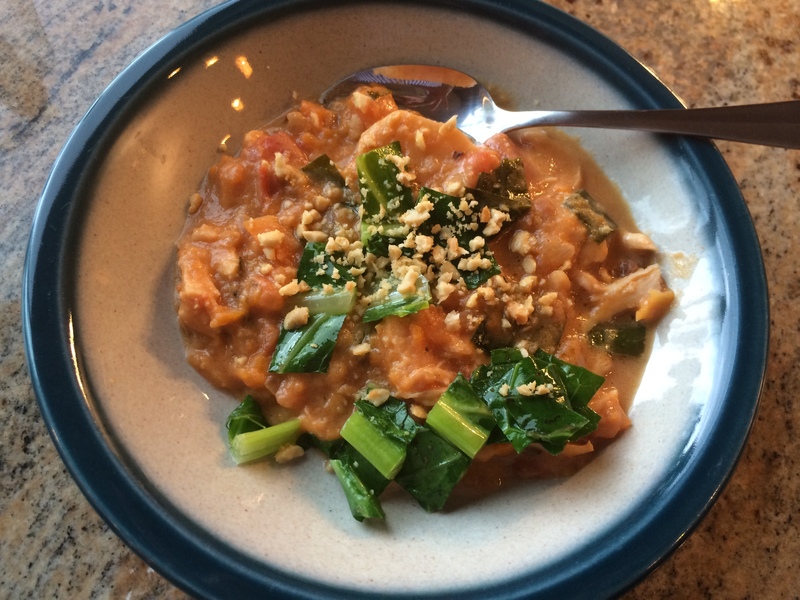 Peanut Stew is featured today thanks to this great recipe prepared by fellow Grandma-in-law (grandson Evan’s other Grandma), Chris, for our potluck last week as mentioned in Tuesday’s post. She adapted the recipe per her notes below and it was absolutely delicious! The original recipe serves six and is easily adaptable to vegan, omitting the chicken and using vegetable broth. I will add this recipe to my favorites. Add the chicken; cook and stir until completely browned. Season with the crushed red pepper, salt, and black pepper. Pour the chicken stock over the mixture. Stir the sweet potatoes into the liquid and bring the mixture to a boil; reduce heat to low, cover the pot partially with a lid, and cook at a simmer for 15 minutes. I had extra collard greens and one review suggested to sauté them as garnish along with chopped peanuts. The original recipe was found on Epicurious.